Duct Cleaning is one of the most important parts of regular house cleaning. The air that you breathe is very important to your overall well being. And the quality of your air is directly dependent on the condition of your HVAC system. These dust mites travel through the air when the air circulation is on, causing a lot of allergies to you and your family. If you have babies in the house or people that suffer from respiratory illnesses than HVAC cleaning should be of utmost importance to you so as to kill dust mites. Toms Duct Cleaning Melbourne professional suggest the following in order to take care and clean the air ducts to keep your home happy healthy and disease-free to kill dust mites. 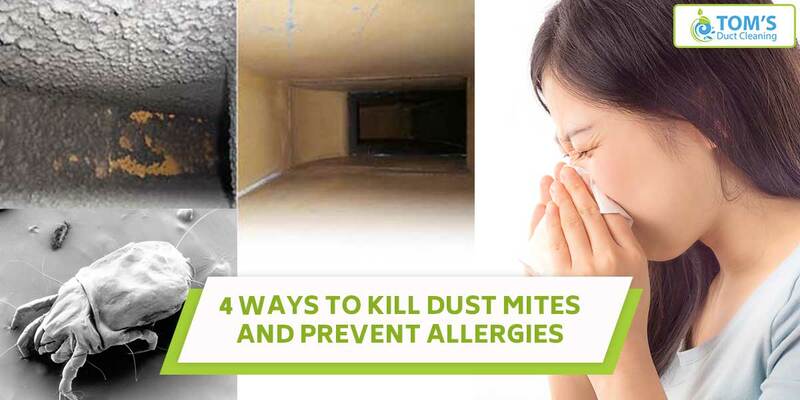 Your Air ducts collect dust, allergens, skin flakes, and other dirt every day as you turn it on and off. This naturally contaminates our air. The debris of the dirt percolated in your HVAC system promotes dust mites in the ducts. The filters collect the most of dust and should thus be replaced from time to time. Vacuum your air ducts, so that you clean them of the dust mites, also since the air is blown by dirty vacuum would have caused dust mites in the fabric of your furniture upholstery and bedsheets as well, make sure you vacuum them on a daily or every alternate day basis. An air cleaner can help your home get rid of contaminants and irritants, including dust mites. They work as a part of your HVAC system to neutralize dust mites in your home, so you don’t have to suffer through the symptoms of your dust mite allergy. If your efforts do not work out and your air still feels damp and the symptoms of dust mite allergy do not seem to go away, the only thing you can and should do is to seek a professional air duct cleaning service. A hassle-free way to get rid of all your HVAC problems in no time. To know if your ducts are contaminated by dust mites a duct cleaning professional can help, Toms professional gives you a free HVAC check-up. To get a professional HVAC cleaning call us on 1300 068 194.